The project target is to halt habitat degradation and lost of species in the middle basin of the Biebrza Valley within the borders of Nature 2000 sites: SPA "Ostoja Biebrzańska" (PLB 200006) and SAC "Dolina Biebrzy" (PLH 200008). The main environmental problem is caused by a network of draining canals built in XIXth century under Russian Tsar administration which significantly lowered ground water table of neighbouring peatlands and changed habitat conditions in the region of two rivers – Jegrznia and Ełk as well as two canals: Rudzki and Woźnawiejski. Project area is a breeding territory of number of rare and endangered bird species in Poland and Europe including more than 20 bird species listed in the Appendix 1 of EU Bird Directive e.g. both Lesser and Greater Spotted Eagle, Short Toad Eagle, Black Grouse, Corn Crake, Curlew, Great Snipe, Eagle Owl, Whitebacked Woodpacker, Aquatic Warbler, Bluethorat, Bittern, Short Eared Owl. Additionally, 6 type of habitats included in the UE Habitat Directive were recorded in the project area too: (6510 Lowland Hay Meadow, 6410 Molinia meadows on calcareous, peaty or clayey-silt-laden soils, 6120 Xeric sand calcareous grasslands, 7230 Alkaline Fen, 91D0 Woodland Bog, 3150 Natural eutrophic lakes with Magnopotamion or Hydrocharition – type vegetation) and other species listed in the Appendix II UE Habitat Directive e.g. Wolf, Otter, Beaver or European Fire-Bellied Toad. 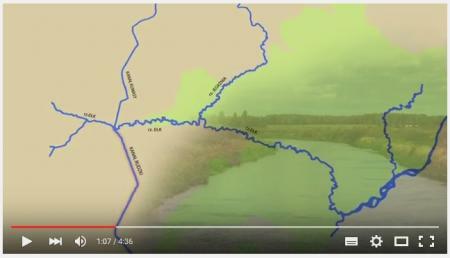 Create conditions to stop degradation processes on hydrogenic habitats in the vicinity of water system: Rudzki Canal – Ełk river – Jegrznia river – Woźnawiejski Canal. Improve habitat conditions for avifauna of none forested ecosystems. 1. Water regime flow in the water system Kanał Woźnawiejski – Jegrznia river will be change towards increasing water flow in Jegrznia river. During vegetation season water flow will be increased by three times in comparison with a low water level period through restitution action. 4. Habitat conditions for bird formations related to wetland none forested ecosystems will be significantly improved on area of 110 ha. Presentation about the need of restoration of hydrological network in the middle basin of the Biebrza valley.